If I'm honest I didn't think I would get here but as you can see, here I am! I made it through to week 2. To read about this crafting/photo challenge please read my first post here. As I thought I am struggling with time if I use my 'big camera' as with my computer being so slow the whole uploading process, just for one photo, really isn't worth the stress! I have resorted to using my phone and to be honest, the pictures aren't too bad (apart from the most boring photo in the world- I'm sure you can guess which!) if you don't look too hard, or blow them up big (essentially they are ok if you look at them on your phone). I've realised that there is no point stressing over this because as much as I would love a beautiful Instagram feed and blog I feel that this challenge is more about documenting my craft and actually getting on and doing it rather than worrying about producing perfectly presented images. 3) I started on another large wreath. You will have to wait til next week to see it in its full glory though (unless you follow me on Instagram- Sal_Strawbs). 4) Now this was fun. 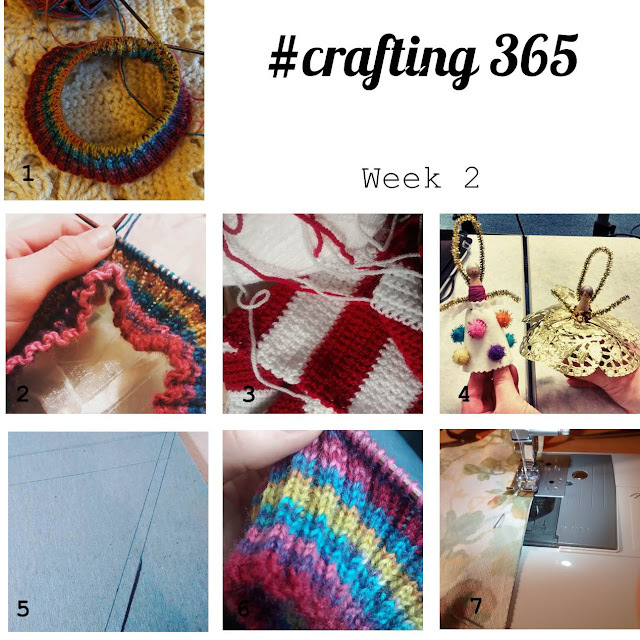 I am a member of a small local craft group and we meet every couple of weeks, taking it in turns to lead an activity. This week was peg fairies, and allowed me to relive my childhood and let myself go creatively, as you can probably tell! 5) THE most boring photo on the internet? It was an essential piece of kit- a template for cutting out fabric for bunting. 6) Sockhead hat again- Saturday was a bit of a nightmare.....though it meant 3 and a half hours of knitting time on a train and then a coach. I'd forgotten just how slow knitting in 4ply is, though I managed to almost finish the turn-up brim.